Here, 10 tasty pantry staples to jump-start a shift toward healthier living, regardless of whether you eschew meat. 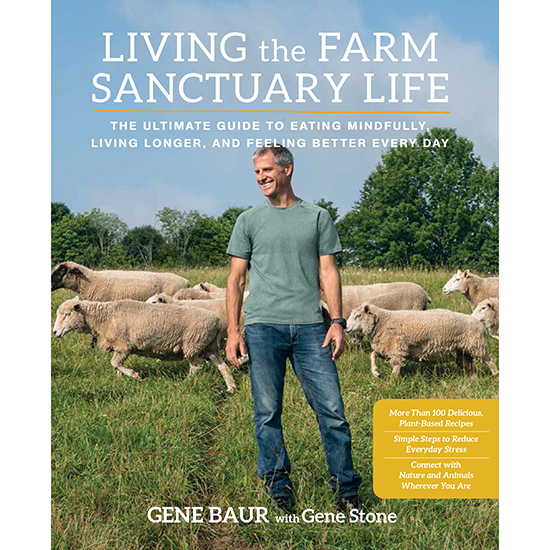 Time magazine has called Gene Baur “the conscience of the food movement.” The president and cofounder of Farm Sanctuary, the world’s largest refuge for farm animals, loves animals—but not on his plate. In his new book, Living the Farm Sanctuary Life, the influential activist outlines five tenets to live in greater alignment with one’s values, which in his view means sticking to a plant-based diet (to that end, he offers 100 easy recipes). For vegans and meat eaters alike, though, his meatless pantry is a smart and simple way to clean up the body after a sluggish winter. Here, 10 tasty pantry staples to jump-start a shift toward healthier living, regardless of whether you eschew meat. This wonder ingredient binds things together and is used to make seitan, a savory protein source with a delicious, meaty texture. Give a cheesy flavor to pasta, soups or even popcorn with a sprinkle of nutritional yeast. Found in the bulk section, these tasty little flakes are packed with flavor and vitamin B12. When baking, replace eggs with canned pumpkin or unsweetened applesauce for rich, moist brownies, cakes, muffins and breads. Use 1/4 cup for each egg called for. Works great for boxed mixes, too. Cashews are a staple for many top vegan chefs, who use them to give amazing, creamy texture to sauces, dairy-free cheeses and desserts. Soak raw cashews in water overnight. In the morning, drain and rinse them, then add to a blender with just enough water to cover. Blend until smooth, and you have a fabulous substitute for heavy cream. Like butter, only better. This nonhydrogenated, oil-based, nondairy spread can be used in recipes, on toast or anywhere you'd normally use butter or margarine. Try brands like Just Mayo or Follow Your Heart Vegenaise. They are great not only to spread on sandwiches but also for making dips, dressings and sauces. This concentrated bouillon paste can be used to make delicious broths for soups and sauces. Start with Vegetable Base, No Chicken Base or No Beef Base for a hearty, comforting bowl of soup. Available as flakes or powder, this sea vegetable works just like gelatin (which is made of animal byproducts). Use it to create fruit desserts or even to make your own vegan cheeses. Made from sesame seeds, tahini is great as a base for dressings and sauces. We prefer raw sugar so we don't have to wonder about the processing. It's great to have in the cupboard, because what's a meal without dessert? Reprinted from Living the Farm Sanctuary Life by Gene Baur with Gene Stone. © 2015 by Gene Baur.